Fifteen years ago, I got my first glimpse of North America's longest river. Driving west toward the Dakotas I crossed the Missouri River just outside of St. Louis. Craning my neck to look between the steel girders of the interstate bridge, I looked down upon its dark waters flowing benignly along the last stretch of a 2,341 mile journey to its mouth. 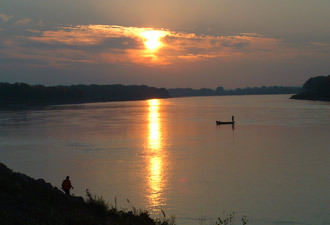 Could this really be the mighty Missouri traveled by Lewis and Clark – the river once known for its wild and unpredictable sojourns? Fifteen years later, I saw the Missouri River again for the first time — the real Missouri River — the relatively natural, free-flowing one, designated by Congress as a Wild and Scenic River. This time I saw it up close working as a ranger for Missouri National Recreational River. The park, along the South Dakota-Nebraska border, truly embodies the rich history of this incredible waterway. Setting out by boat along what is known as the 39-mile reach, just below the remnants of historic Fort Randall, I traveled downstream with fellow rangers and park stakeholders. Suddenly we were floating through a waterscape of braided channels, chutes, and gigantic sandbars. A historic flood in 2011 created new side channels, washed away sandbars, and recreated marvelous new ones just a few hundred yards away. This flooding left behind prime habitat for threatened and endangered species. On this journey we passed by the Karl Mundt National Wildlife Refuge, known for its prime eagle nesting habitat. On the river banks, I saw multiple cottonwoods ornamented with eagle nests. 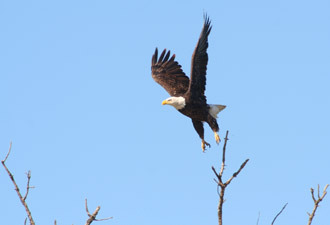 Our national symbol could even be spied soaring gracefully above the ever shifting channel as we traveled downstream. We soon saw a kingfisher pursue its lunchtime meal, only to lose its catch among the waters. Stopping along one newly created sandbar that stretched larger than a football field, I learned that two other rare species of birds rely on these sandbars for nesting habitat: the threatened piping plover and the endangered least tern. The Missouri National Recreational River is a bird lovers' paradise and follows one of the continent's great migratory flyways. Nearing our journey's end we witnessed an explosion of fall colors atop the cottonwoods lining the banks. Leaving the river at Verdel, Nebraska, our adventure ended not far from the confluence of the Missouri and Niobrara Rivers. The meeting of these two Wild and Scenic Rivers, can best be viewed from the river bluffs at Niobrara State Park. What a day it had been and this is only the beginning! The Missouri National Recreational River restores a sense of adventure to countless South Dakotans, Nebraskans, and Americans whose lives are so dependent upon its waters. As I discovered for myself, visitors can see and experience the real Missouri River for the first time. At the Missouri National Recreational River, the “Mighty Mo” flows wild and free, as nature intended. Note: The 39-mile reach of the Missouri National Recreational River stretches from just below Fort Randall Dam to Running Water, South Dakota. It also includes the 20 miles of the lower Niobrara River and eight miles of Verdigre Creek. 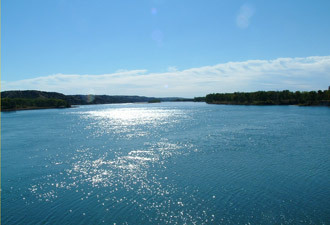 The 59-mile reach of the national park stretches from below Gavins Point Dam to Ponca, Nebraska.